If your auto sales representative tells you that a particular vehicle features an infotainment system, that term refers to all the in-car communications, data and entertainment presented to the driver on a centrally located screen. Although the term was initially used in 1980 by a group of U.K. scientists, it's only been in recent years that infotainment has become a multi-billion dollar industry, at last count almost $34 billion in 2016. 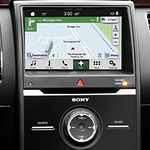 Many major car manufacturers, including Fiat-Chrysler, Ford and GM, all have proprietary names for the infotainment systems included in their top-selling vehicles. Most of the screens are operated by nearby buttons, although voice control is becoming more popular so that drivers can keep their hands on the steering wheel. KIA offers an excellent infotainment option on our new vehicles, as well. You'll discover that our models rival what you'll find in the competition. Some vehicles now feature entertainment screens facing the rear seats to entertain your passengers. Infotainment makes it easy for driver and passengers to access music, texts and podcasts when traveling.